BOSTON - Yuki Kawauchi became the first Japanese man in 31 years to win the Boston Marathon on Monday with his fourth marathon triumph of the year while Desiree Linden became the first American women’s winner at Boston since 1985. Both surprise champions endured the coldest start in 30 years as well as gusting winds and steady rain in taking landmark triumphs in the 122nd edition of the famed 26.2-mile (42.1 km) showdown over city streets. “For me, these are the best conditions possible,” Kawauchi said through a translator. Kawauchi overtook defending champion Geoffrey Kirui of Kenya over the final 2 km in heavy rain to win in 2 hours, 15 minutes and 58 seconds, with Kirui finishing in 2:18:23 and American Shadrack Biwott 12 seconds further back in third. 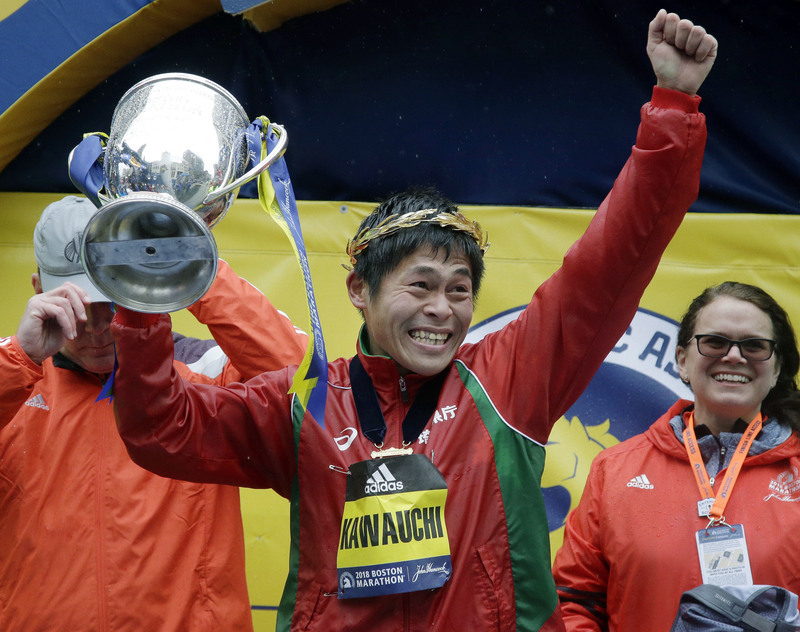 Kawauchi became the first Japanese men’s winner at Boston since Toshihiko Seko captured his second title in 1987 and the eighth Japanese man in all to win the race. 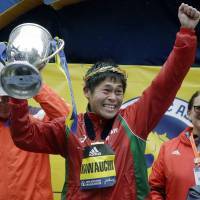 It was Kawauchi’s fifth consecutive marathon victory after last year’s Hofu Marathon in Japan, a New Year’s Day marathon at Marshfield, Massachusetts, Japan’s Kitakyushu Marathon and Taiwan’s Wanjinshi Marathon. Linden overtook Ethiopia’s Mamitu Daska and Kenya’s Gladys Chesir at Heartbreak Hill after the 20-mile mark and kept the lead from there to win in 2:39:54. American Sarah Sellers was a distant second in 2:44:04 with Canada’s Krista Duchene third, another 16 seconds adrift. No U.S. woman had won the Boston crown since Lisa Larsen Weidenbach 33 years ago, but Linden did it in the sixth Boston start of her 16 marathons. “I love this city, this race, this course. It’s storybook. I’m thrilled to be here and to get it done,” Linden said. Linden lost by only two seconds in 2011 and was fourth in 2015 and 2017. Elite competitors began in rain coverings and at a slow pace in the coldest start since 1988 at 38 degrees (3.3 C) with rain often blowing into runners’ faces. Kirui, who set the halfway pace at 1:05:59, failed in his bid to become the first back-to-back Boston men’s winner since compatriot Robert Kipkoech Cheruiyot in 2006-2008.